Friends, I'm not sure what kind of food blogger does this. Two cakes, two weeks in a row in JULY? WHAT? This was not in my plan, of course. My plan was to bring you a healthful, veggie-loaded pizza on a homemade multi-grain Hawaiian-inspired crust. BUT, then this week happened. This week with it's share of, um, NOT ideal moments. Let's see, I locked myself out of the house, (twice) got a parking ticket, ran over a turtle, (I'm a terrible person, I know) showed up at 2:00 for a 4:00 meeting, thought I had lost my cellphone, (and made a 15 minute drive back, only to discover I had been sitting on it the whole time) broke one of the champagne glassed from our wedding, (and by broke, I mean it flew off the top shelf--where I had precariously placed it--hit me in the arm, and shattered into a thousand shards of glass all over the counter.) Oh, and our kitchen sink has been completely clogged and nonfunctional for the past 48 hours. I'm not sure if all these mishaps are the cause of, or the result of my general fatigue and/or emotional state, but suffice it so say it's been a rough week. Seemingly innocuous tasks like transferring a prescription or buying a parking permit have somehow morphed into majorly stressful life events that I can't.even.handle. Any-who. This is a beautiful cake for so many reasons, the main ones being that it is sweet-moist-tender-delicious, kinda healthy, and very easy to create. After I tasted it, I knew I had to share it with you. I'm revealing all my secrets today. Have you ever read a recipe that says "butter, softened" and thought, "Man, I wish I was the kind of responsible baker who left their butter out on the counter overnight so that it would be perfectly softened." and then, somewhat shamefully, microwaved your butter in 10 second increments until it resembled "softened" but not completely melted, all the meanwhile fervently praying it wouldn't screw up your recipe? Me neither. In a kitchen with a nonfunctional sink, certain sacrifices and short-cuts have to be made. I microwaved my butter. I used a whisk instead of an electric mixer. And, because it's summer and I'm still trying to be healthy, I substituted half of the flour for almond meal. Then I placed way too many cherries on top, pressed them into the batter gently with my hands and placed that cake in the oven. What emerged 40 minutes later was a warm, gem of a cake. Unevenly studded with deeply purple cherries, the cake was, as I would like to think Adam might describe me in the midst of my woes this week, (but, who I am kidding??) a beautiful mess. Preheat oven to 350 degrees. Butter and flour a 9-inch spring foam pan. In a medium bowl, whisk together the flour, amond meal, baking powder and salt. Set aside. In a large bowl, whisk together the partially melted butter and sugar until smooth. Add eggs and almond extract and continue whisking until smooth. Gradually whisk in flour mixture, stirring until just combined. Pour batter into prepared pan and smooth with a spoon. Place cherries on top, aiming to cover the entire surface. 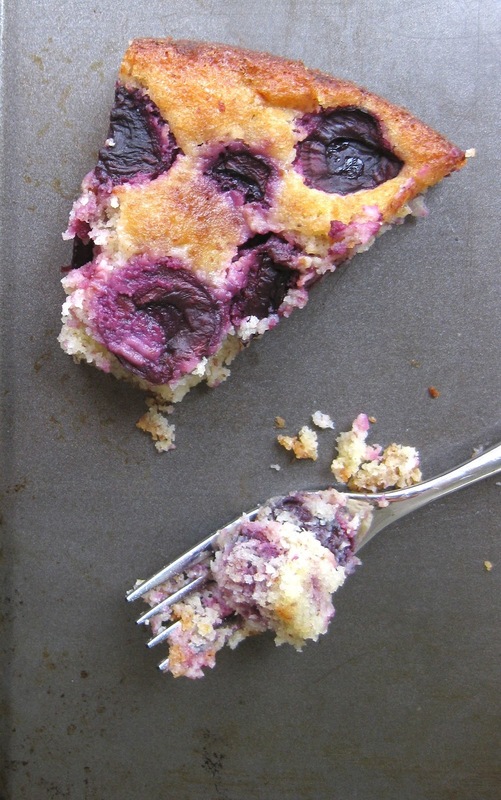 Once cherries are placed, use your hands to gently press the cherries into the batter. Girl you DESERVED this cake after your crazy week!! I rarely soften butter anymore...usually I'll cut it into pieces and just beat the crap out of it with my mixer before creaming in the sugar. Shame on me. This cake is gorgeous, regardless of the shortcuts you took! Win. 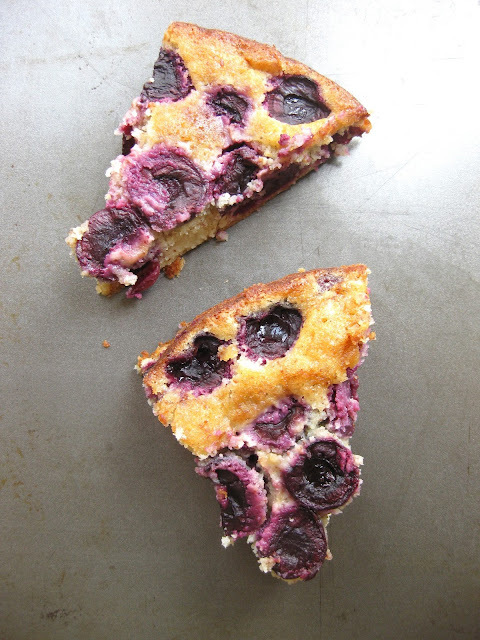 Cherries and almonds work well together in this cake recipe that is great for holiday baking. Hey, I'm Trisha. Come share some food with me!